In my previous post I told you about the high water levels we had. A really impressive sight, but also causing troubles for people and animals. Several hundreds of people had to be evacuated from small villages in the northern parts of the Netherlands because of the threat of breaking dykes. But also for animals the water wasn’t all that good. For the small mammals living on the Oosterkwelder (the salt marsh covering the eastern part of Schiermonnikoog) their habitat got inundated. This meant they had to find another, dryer place to live for a while. Many of them (especially the mice) will drown while doing so, but the fortunate ones will find a dry place. When I was on the island, the water levels were dropping already, but I still saw several Hares at places where you normally never find them. 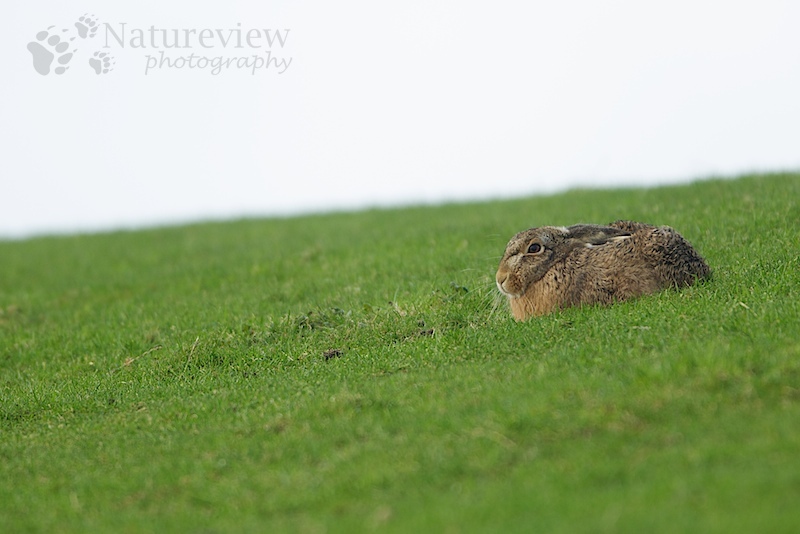 This Hare (and two of his friends) had chosen one of the dykes as their refuge. A safe place, as the dykes are often the highest point in the landscape. This one was enjoying the sun a bit in the lee side of the dyke.